Panera does a great job of warning customers that wheat, egg, dairy, and other common allergies are used in their bakeries and that cross-contamination may occur. Every Panera has a sign right behind the cashiers saying so. To my initial shock, they’ve also launched a “gluten conscious” cookie, even though it’s not quite gluten free. Full disclosure, Panera Bread is one of the top five places I miss being able to eat at since my celiac diagnosis. It happens to be a family and friend favorite, and I miss those memories associated with the food as well as being able to pick up lunch to-go after weekend grocery shopping trips. Since celiac disease, I’ve heeded Panera’s warning signs and have only eaten at one of their restaurants twice… under desperate circumstances. There’s too much bread and bread baking going on for me to even want to consider it safe. Both times I did eat there I was traveling and Panera was the only place where I could cross my fingers and beg and plead for them to make me a gluten-free salad with vegetables from the back. And both times very-kind and considerate managers did just that. So, kudos and a million thanks to them there. But now back to the “gluten conscious” cookie. I went into Panera today to get lunch for my dad and brother and noticed that they had a new oats and nuts cookie. (I don’t remember the exact name and I can’t find it online). When I asked the worker about it, she said it was, “For people that are gluten conscious”. I paused. Then laughed out loud. I guess I’ve never heard that term before and it seemed hilarious to me. The poor girl looked at me with a slightly confused expression and tried to explain that it’s meant for people who are looking to avoid gluten and that it was only gluten conscious and not gluten free because it could contain wheat. Sure enough, when I flipped the cookie over, the first ingredient was “oats (which may contain wheat)”. My first thought was: So what’s the point of having a “gluten conscious” cookie if it could contain gluten? As I struggled to find the right words to say, I looked up and saw an advertisement for said cookie. It boasted the “gluten conscious” label. However, then I noticed in the corner of that poster was a warning that it was not intended for those with celiac disease or a severe allergy or sensitivity to wheat or gluten. So, basically, the cookie was indeed created and intended for people who have no diagnosed problem, who as the worker said, just don’t want to eat it. It took me a minute for that to sink in. And then it made perfect sense. Once I removed myself from my celiac mindset (either things are gluten free and safe or they’re not), I remembered there is a whole lot of people (Paleos jump into my head), who choose to forgo wheat and gluten because they believe it’s not good for their body. Please note, I cast no judgement on those people–I truly believe that modern wheat isn’t what our bodies are used to and people who don’t have a diagnosed condition may benefit from not eating it, and I do appreciate Paleo restaurants (Hu Kitchen in NYC rocks) since they don’t use gluten in the restaurant. Panera, in its brilliant marketing plan and desire to target millennials, has created a product targeted specifically for those people. Good job to whoever coined the term gluten conscious. It’s still making me smile. I’ve read many articles about whether the popularity of a gluten-free diet is a positive or negative for those of us with celiac disease or severe allergies and sensitivities. I must say it does have its pluses and minuses. Unlike in some instances I’ve come across, I applaud Panera for being so open about who should not eat their food. For those of you that follow my blog and are one of those people choosing not to eat gluten, Panera has an entire page devoted to gluten conscious eating on their website. There are a handful of frozen drinks, several salads, which could possibly be modified to be vegan, and black bean soup (already vegan and really, really good) that do not have gluten in it. They also have a plethora of items that can be modified to remove gluten-containing ingredients for those avoiding it. On a side note, I once heard a rumor that Panera tried to create a gluten-free bread, and due to the huge risk of cross-contamination and people getting sick, were forced to remove it from its bread shelves. It may be that experience that has made them so aware of being open and honest in their advertising. 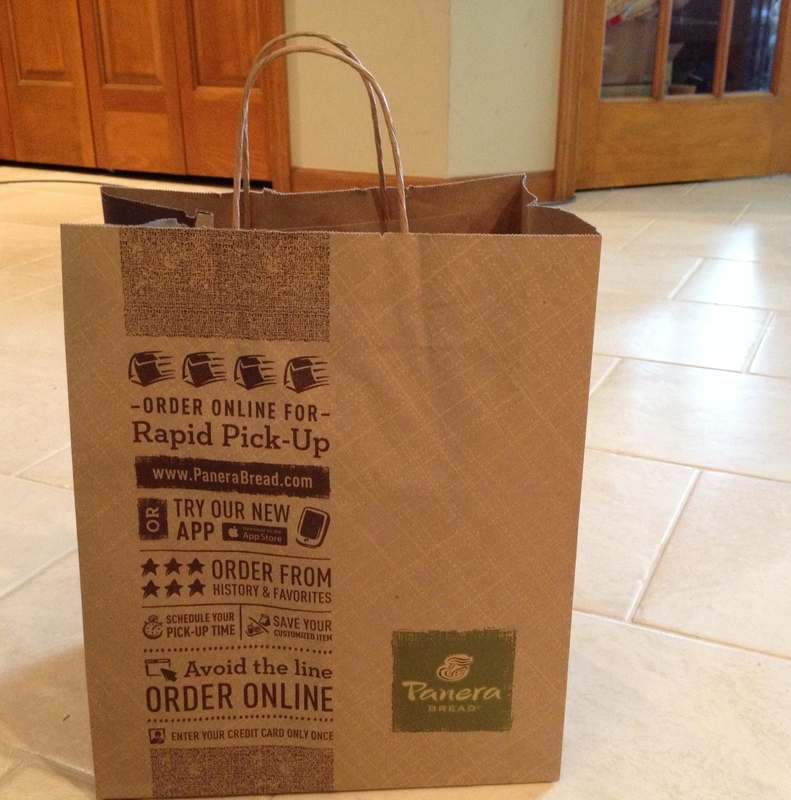 As I walked out of Panera, I realized I will (most likely) always miss Panera’s soups, salads and freshly-baked breads. It would be impossible for Panera to make celiac safe products without building entirely gluten-free baking and preparation areas… bread is their specialty. Until then, I can’t wait to see what “gluten conscious” baked good they come up with next. Oats and nuts bagel, per chance? Do you know if these cookies contain dairy and eggs? Yes, they do. Unfortunately :(.